Part three of my self-imposed challenge to do something spooky every day of October. My two favorite reasons for October collided as I drove 90 miles to surprise my mother for her birthday while fitting in my Spooky activity: listening to a Halloween-themed episode of “This American Life.” That was pretty great, but not as great as surprising my ma. She is the best. The Soap Factory in Minneapolis has gotten pretty infamous for its Haunted Basement, and with good reason. Sabrina and I went together for the first time three years ago, and it remains the best “haunted house”-type experience of my life. This year’s was a close second. I screamed like a little girl and clutched strangers’ arms and at one point told a ghoulish man “You have lovely hair.” He didn’t. That was my actual knee-jerk response in a moment of panic. So basically an average Saturday night for me. I went to the St. Paul Art Crawl with one goal in mind: to pick up a “Brain Belt” print from the official Zombie Pub Crawl artist DWITT. I love his work in general, but add in zombies and beer and I can’t resist. Zombies and beer add value to everything. Anyway, I got my Brain Belt print (and a few others), and really enjoyed being a dork around one of my favorite local artists and his wife. They are super nice, they gave me a beer and they think my name is Leslie. Overall a win! 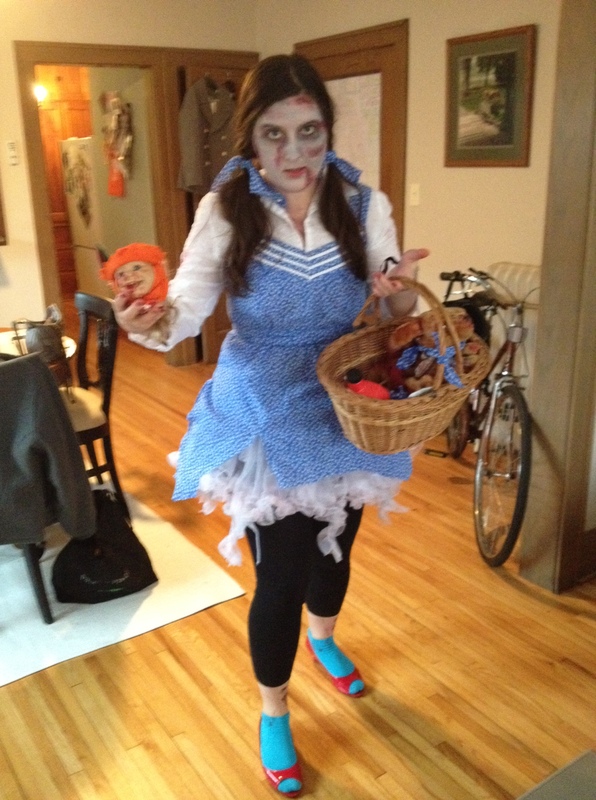 …because what’s Zombie Dorothy without her basket of munchkin heads? 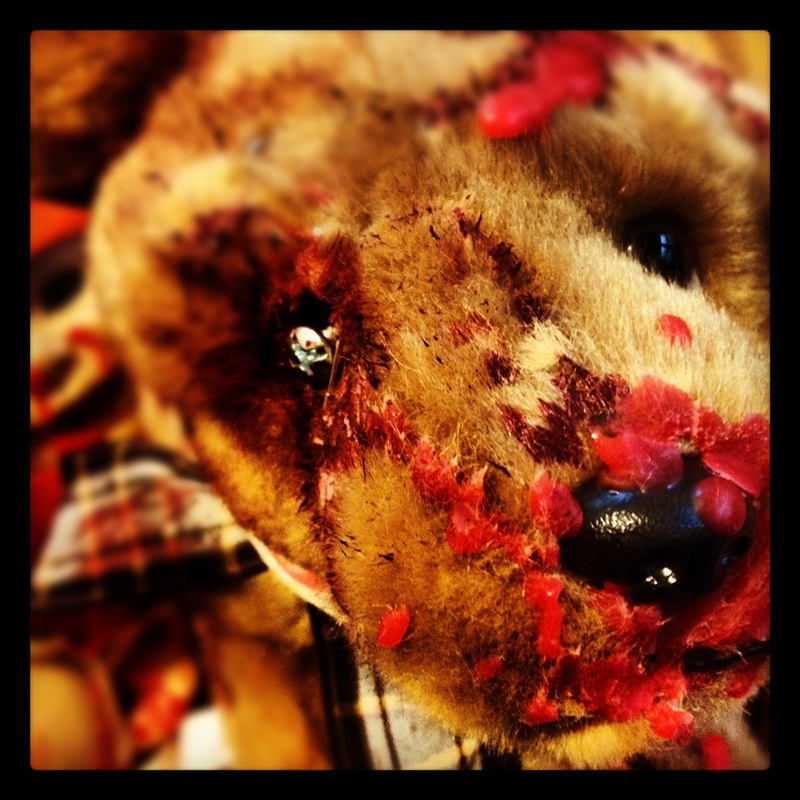 And her companion, Zombie Toto! – coming up with insults about DMX during the 1.5 hour wait for him to show up. You’re not Kanye, we’re not honored by your lateness. We’re getting on the bus to go back to Minneapolis and thinking nice thoughts about the Gin Blossoms. – and just general running around. Literally. Zombies aren’t supposed to run, but when I’m excited and have more than one beer in me I’m always about one second away from taking off in a sprint. As in, “all of my friends are here I WONDER WHAT’S OVER THERE.” Like a dog. Maybe I should have just gone as Toto.